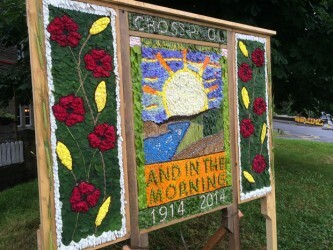 From May through until September well dressings decorate several Peak District towns and villages. Well dressing is a summer custom in which wells or other water sources are decorated with designs created from flower petals. Wooden frames are covered with clay mixed with water and salt. A design (often with a religious theme) is sketched on paper and this is traced onto the clay ready for the decoration. This entry was posted in What's on on January 18, 2015 by sheila.